My name is Deena Dietrich. I have been a U2 fan for 30 years, starting with The Joshua Tree. 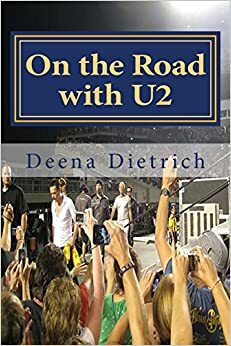 I wrote my U2 memoir called On the Road with U2: my musical journey. It is about the 75 (now 90 – soon to be 100) U2 shows I’ve been to from ZooTv to 360, including my three-month road trip during the last leg of the 360 Tour where I drove to every U.S. concert. More than just the concerts, it is about the places I’ve been, the people I’ve met, and my quest to meet Larry. Click here to buy On the Road with U2. I continued my musical journey in 2015 on the U2ieTour going to 15 shows in Vancouver, Denver, Chicago and New York City where I finally met Larry again after 14 years, got my picture with him for the first time after 23 years of touring and gave him a copy of my book I just wrote. This summer I embark on something I thought would never happen … THE JOSHUA TREE TOUR! I am going to 10 shows in Chicago, Pittsburgh, Miami, Louisville, Philadelphia, DC, New Jersey and my 100th U2 show in Cleveland. Please connect with me on Twitter, Facebook, YouTube, Pinterest, Google+, my other blog DeenasDays or you can email me at deenadietrich@gmail.com. I found your comments on Facebook and had to check out your blog. I love that you are taking time off and following the band by car this summer. Plus, you are going to make a documentary about the events. 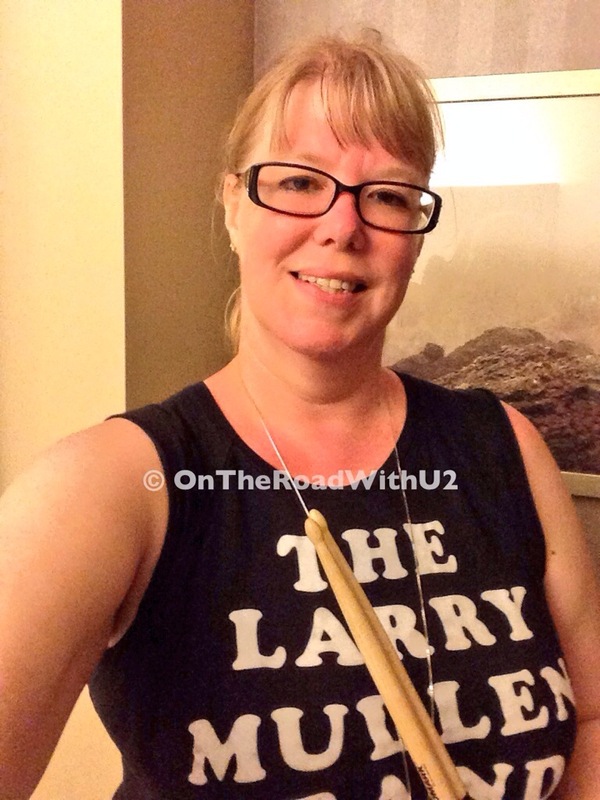 I highly recommend you write a travel log about all of your great U2 adventures. I invite you and your followers to check out my memoir: I’m a Fan: How I married U2 into my life without going to the altar. You can check it out on amazon or visit my site. I hope to see you in Chicago and share road stories. Thanks Eric. Yes I am writing a book about my travels on all the U2 tours I’ve been on since ZooTv, continuing with all the US shows this summer. But while I’m on the road this summer, I’ll keep everyone updated of my travels here on my blog. Sweet Deena: I’ve read and seen everyting in your blog. It is really amazing. You’re incredibly committed, and all the sacrifices you have been making for love has set a beautiful example. I wish I could spend time and money doing the same with the band I love. And the love and admiration you get from other fans…. that is your reward. You work really hard, so you deserve having met Larry Mullen Jnr., who happens to be the lad I love the most. You know I’m following you on Twitter. God bless you, Deena. You’ are one of a kind. Love and peace, U2 girl. Congratulations! Loreley, South America. (Mendoza, Argentina). It’s Marie, Abbey’s friend. You know, the one who made your dogs go crazy outside the VQ at midnight in Denver, LOL. Woops. Anyway, I did not realize that you were following U2 so that you could write a book/memoirs. I contemplated writing a book about my experience as a U2 fan too. That, however, has morphed into a self-help book for people recovering from addiction. I joined PennWriters recently so I will have other authors (experienced and newbie) and have actually been getting somewhere with their help. U2 and their music have helped me grow spiritually and my “U2 experiences” have given me reprieve when I felt hopeless. Meeting Bono and Edge in Denver has proven that anything is possible, and I plan to incorporate that memoir at the end of my book. The Denver experience was my first as a debt-free person. Anyway, I wish you all the best with your final project and definitely look forward to reading it. Mine won’t be finished anytime soon, LOL!! Perhaps I’ll run into you again in Philly or Pittsburgh! God bless! Well I’m following U2 on tour because I’ve always wanted to. I’ve recently discovered I like to write, so I’m writing my U2 tours memoir. Hopefully I’ll see you in Pennsylvania! Hey I think I saw you at the show in Philly! This was my first show being up close to the stage, and I wish I could go back or go to another right NOW! How excellent that you are going to ALL of them! Best wishes, and I’ll be looking for your book! I discovered your blog today (love it, btw!) while doing some research before heading to my first U2 show this weekend in Minneapolis. The show starts at 7pm and Interpol is the opening act. From what I have found online, it sounds like U2 will likely take the stage around 9pm and play for about 2 hours and 15 minutes. Is this consistent with the shows you have been to this summer? As you are probably aware, the show got rescheduled from last June. Now we have a newborn at home and are trying to make plans accordingly (i.e. babysitter, etc). Thanks so much for your help! Thanks. I’m glad you like my blog. Yes U2 comes on anytime between 8:45-9:15 and play for about 2 hours. See you in Minneapolis! I saw ya in minneapolis, but didn’t dare leave my spot 🙂 to introduce myself. Just saw on Facebook about the wonderful ending you got last night. How nice to acknowledge your love of the band 🙂 So happy for you! Love this site!!! Its so awesome that you followed them on tour and interacted with them so many times!!! I went to my FIRST U2 show in Nashville!! 🙂 🙂 I was on the outer rail on the left side (right up against the rail) I would LOVE to see them again!!! I HAVE to ask you this and i hope you don’t mind… but HOW DO YOU AFFORD IT!!!???? lol tickets aren’t cheap and neither are hotel rooms, gas ,food etc… lol im not kidding!! I really want to know how you managed to just up and leave on tour with them???? Cause id love to maybe do this someday too and who better to ask than the person who’s “Been there done that”? 🙂 If you can, please email me at Neuro_Mason@hotmail.com Love the write-ups on here!!! Hope to see that book of yours out soon!!! Keep up the great work!!! I just checked your blog.. I just love all your reviews here!! Very enjoyable !! You have seen so many U2 shows..amazing! See you soon on blogs! and big congratulations again for your blog..awesome ! My name is Fernando , 43, live in Brazil , I’m a fan of U2 since 1983 . I have a cover band U2 , is not really a cover because we do not dress like them , but their play as close to the original songs . Youtube has a few parts of my playing U2 songs . Has a blog here in Brazil about U2 , materials , and complete documents , I help the blog owner with some musical secrets , introductions of songs and all the technical stuff about the musicians and the songs . If you ever need me , just say so . Nice to meet you and hopefully we will continue to maintain contact. Have become your favorite page so that every day I look at her. Very cool story! I love U2. I have only seen them twice but both times were amazing. I saw them before 9/11 here in Dallas. Sunday Bloody Sunday saw all the Irish flags flying about in the crowd. Then I saw them shortly after 9/11. I frequently tell people I felt more “ministered to” by the music of U2 then most of the attempts to comfort and make sense of the shared pain of that event. I remember it was not Irish flags flying at that 2nd concert, but American flags. And I wept like a baby when they did One and showed the names of the fallen. It was a great feeling of community and connection at that concert and I will never forget.